A new batch of photographs from the Benson Museum of Local History are now up on DigitalNC. These photos show a glimpse into life in Benson, North Carolina during the past century. 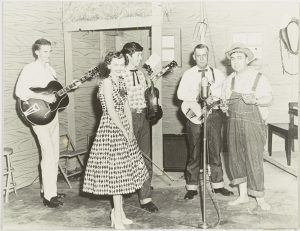 Included are photographs of Benson citizens, businesses, schools, farms, and documentation of the State Annual Singing Convention, which was started in 1921 at a Benson tobacco warehouse, and carries on yearly to this day. A 1967 yearbook from Benson High School is also now available. The 1967 Tatler shows student life at the high school with photographs of the Glee Club, the Library Club, and the Future Farmers of America. Also included are student portraits, athletic team photos, and ads for local businesses. 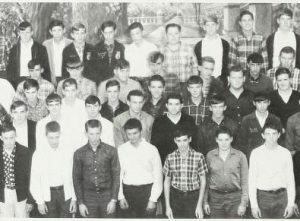 To browse yearbooks provided by the Benson Museum of Local History click here, or click here to view their photographs. To learn more about the Benson Museum of Local History visit their partner page, or take a look at their website. 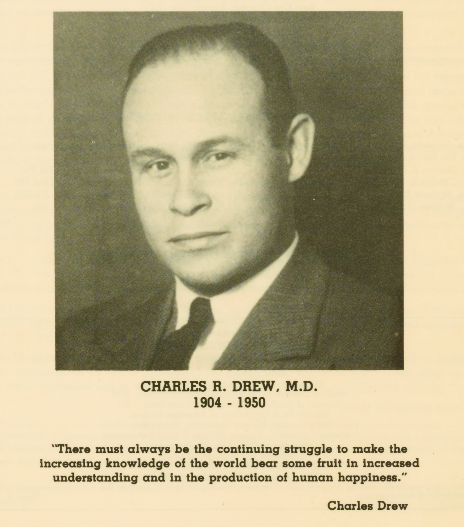 The 1960 Eppesonion yearbook from C.M. Eppes High School in Greenville, North Carolina, is now available on DigitalNC. 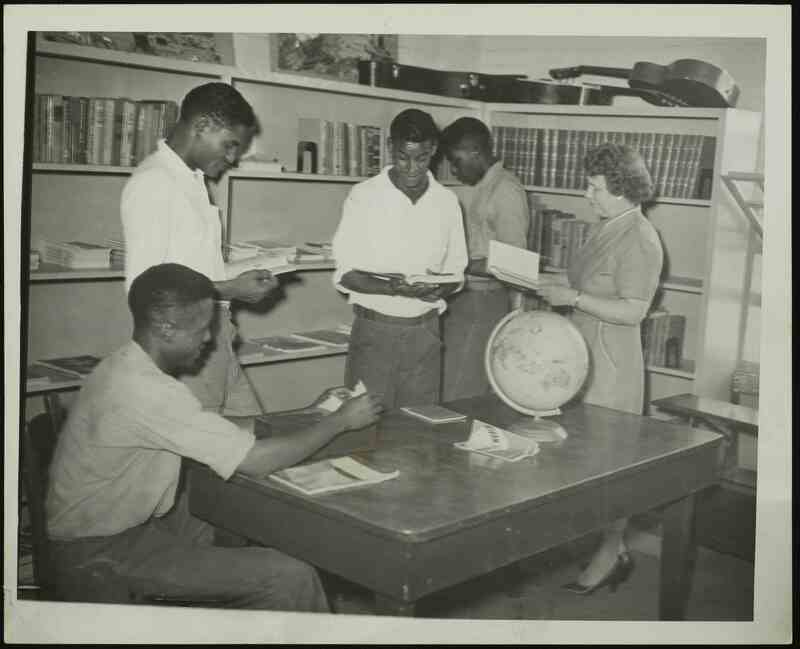 The 1960 edition joins previously digitized Eppes High yearbooks dating from 1955-1969. During the 1969-1970 school year, C.M. 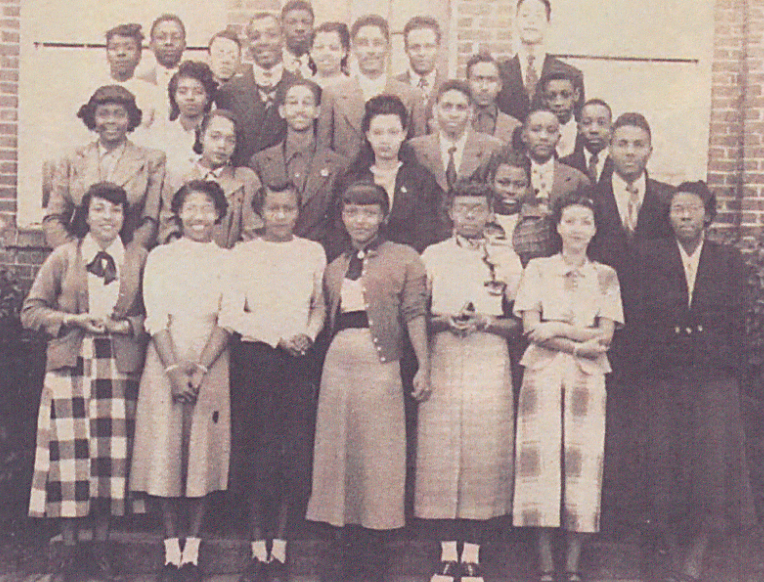 Eppes High School was integrated with Junius H. Rose High School, which is documented in the 1970 Visa, the J. H. Rose High School yearbook. 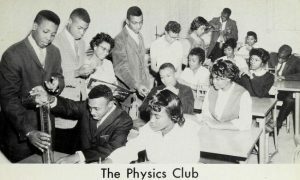 The 1960 Eppesonion has images of clubs and athletics, student portraits, senior superlatives, and more. 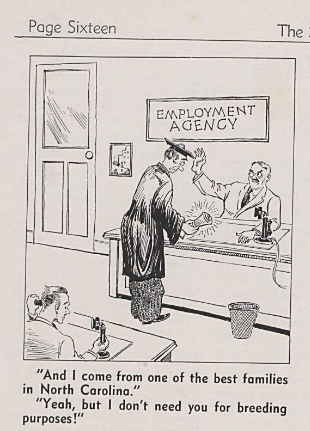 To browse the 1955-1969 editions of the Eppesonion, and the 1970 edition of the Visa, click here. To learn more about, C.M. 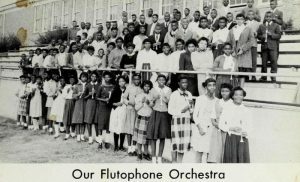 Eppes High School Alumni Heritage Society, the partner that provided these materials visit their DigitalNC partner page. Additional issues of Wake Forest University’s The Student are now online. The additional issues cover 1906 through 1935. 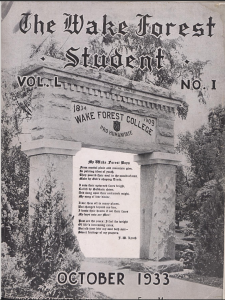 The Student was typically published quarterly and featured articles, opinion columns, and stories written by the students of what was then Wake Forest College, located in Wake Forest, North Carolina. The later issues, published in the 1930s have more of a magazine feel than the earlier issues, which are focused literary journals. Topics covered include World War I, the depression, college life, dating, and social issues such as homelessness, the mentally infirm, and the death penalty. Each issue includes a humor section as well. The later issues also include a number of advertisements for both local businesses in Wake Forest and Raleigh and a number of full color cigarette ads. To read about previous batches of The Student we have digitized, visit here and here and here. Visit Wake Forest University’s partner page to learn more about what they have contributed to DigitalNC. A student worker is shown operating DOLLY on page 6 of the Jan – June 1977 scrapbook. Scrapbooks documenting goings on at Central Piedmont Community College from 1969-1978 are now on DigitalNC. 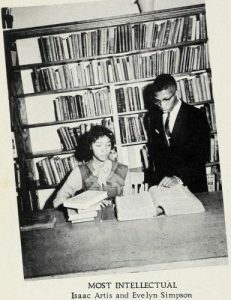 These scrapbooks join previously digitized scrapbooks that cover the founding and first few years of CPCC. Included in these newest additions are newspaper clippings, newsletters, photographs, and other memorabilia that offer a glimpse into life at CPCC. One project documented in several articles throughout the scrapbooks from the late ’70s is “DOLLY” which stands for Dial Our Listening Library Yourself. 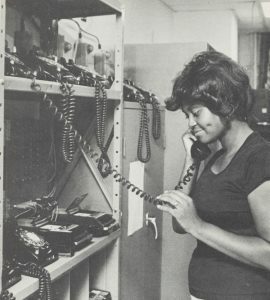 This listening library was started in 1975, and allowed students and local residents to call into a phone system where they could listen to different audio programs. The first programs to be added were old radio programs, but eventually callers could listen to course materials, such as a mini course in spelling. According to an article in the Jan – June 1977 scrapbook, almost 100,000 callers heard programs on DOLLY during its first year of operation. To read more about happenings at Central Piedmont Community College in the ‘6os and ’70s, browse the scrapbook collection here. To learn more about CPCC visit their partner page, or take a look at their website. 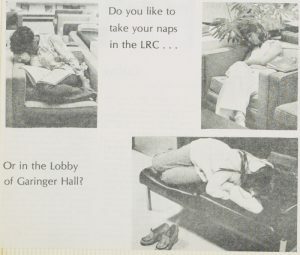 In the Jan – April 1978 scrapbook, a page from a student newsletter shows that some aspects of college life never change. Part of The Wilson Advance header from the March 24, 1876 issue. 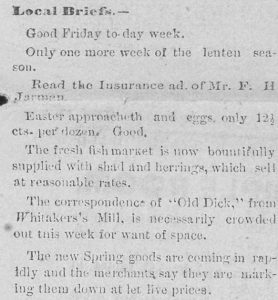 The Local Briefs section detailing happenings of the week as seen on the first page of the March 30, 1876 issue. 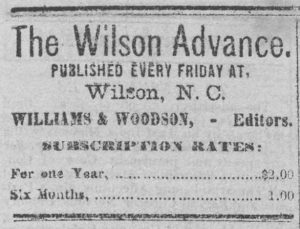 Two more issues of The Wilson Advance from March of 1876 are now up on DigitalNC, courtesy of our partner Wilson County Public Library. These issues join many previously digitized issues from 1874-1899 and give a glimpse into daily life in Wilson N.C. during the late 1800s. The Wilson advance was published every Friday, and included local and national news stories as well as obituaries, marriage announcements, events, and advertisements. To view more issues of The Wilson Advance on DigitalNC, click here. To see more materials from Wilson County Public Library, take a look at their partner page, or visit their website. An advertisement for Leibig’s Liquid Extract of Beef from page 2 of the March 24, 1876 issue. Gavel made from the wood of the Council Oak. A photo of Cecil Liverman from the scrapbook documenting his time as Grand Master of North Carolina. New materials from our partner, The Grand Lodge of Ancient, Free and Accepted Masons of North Carolina are now up on DigitalNC. This batch features minute books, scrapbooks, resolutions, and proceedings, along with images of a historic gavel. 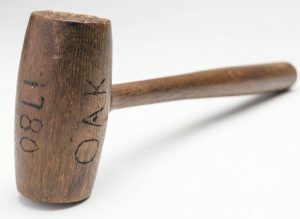 The gavel was made circa 1900 from the wood of the Council Oak at Quaker Meadows in Burke County, NC, where the leaders of the patriot forces met on September 30, 1780 to plan their attack on British and Loyalist forces at Kings Mountain. Two scrapbooks focus on the Grand Lodge career of Cecil Liverman. 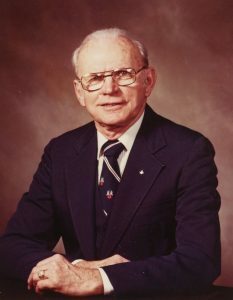 The first documents his time as a Mason Officer from 1976-1983, and the second documents his year as the Grand Master of Masons in North Carolina from 1982-1983. The scrapbooks include photographs, letters of correspondence, news clippings, event programs, and more. 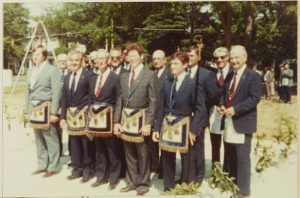 Lodge officers at the cornerstone laying for Selma Lodge #320 on June 2, 1983. 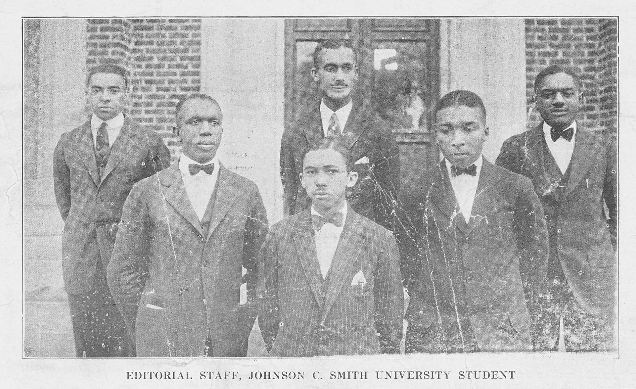 The University Student, Johnson C. Smith University’s student newspaper, is now available on DigitalNC with issues from 1926-1930. Johnson C Smith University, a historically black university in Charlotte, NC was founded in 1867 as the Biddle Memorial Institute. 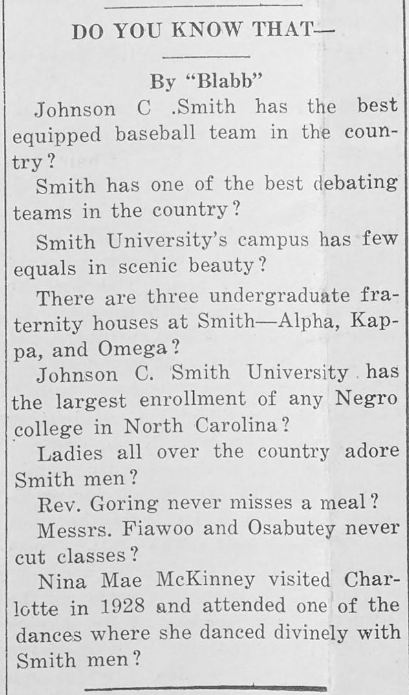 The name was changed to Johnson C Smith University in 1923 after a benefactress’ husband, shortly before the available run of papers were published. The school became co-ed in 1932. To view more resources from Johnson C Smith University, visit their partner page here. And to view more student newspapers from across the state, visit our newspapers here. Today we are highlighting the great materials from our new partner, Beaufort Historical Association. Two items were especially exciting in the first batch of materials, which were prioritized for their fragile condition. One is the account book of Dr. William Cramer, a physician who ran the Apothecary Shop in Beaufort in the 1850s. The account book lists the medicinal items that Dr. Cramer sold to the citizens of Beaufort. The other is the account of Mr. Cecil G. Buckman, a 19 year old local carpenter’s son who was on the schooner Ogeechee to Baltimore from Beaufort in 1873 when it ran into a storm and the ship ran aground on Hatteras Island for several days before the ship’s passengers were able to continue along their way to Baltimore. A great account about the travails and uncertainties of ocean travel even late in the 19th century. 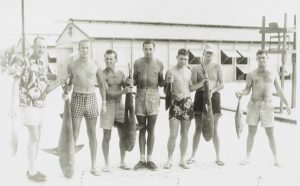 To learn more about our partner Beaufort Historical Association visit their partner page here. 10 years of LGBT newspaper Q-Notes now online! Issues of Q-Notes from 1986-1996 are now available on DigitalNC. These newspapers were shared by our partner, University of North Carolina at Charlotte, in response to our call for materials documenting voices underrepresented on DigitalNC.org. Q-notes focuses primarily on Gay and Lesbian issues both in Charlotte and nationally. At a time when LGBT communities were facing persecution and backlash against increased visibility and demands for rights, Q-Notes provided a venue for individuals to affirm their identities. A headline from a July 1987 article. An interview with RuPaul was featured in the December 1st 1992 issue of Q-Notes. A Q-notes interview with drag queen and musician RuPaul, who hails from Georgia and often performed in Charlotte during the 1990’s, embodies a tone taken in many Q-Notes articles. In a 1992 interview, when asked to explain her drag persona, she says “RuPaul is a universal concept. She’s about self-love and self-acceptance, being who you are and being proud of who you are.” This interview occurred right before RuPaul’s music and modeling career took off nationally, and her current success as a pop-culture star in many ways mirrors the increasing acceptance of LGBT culture within the US. Other articles in Q-Notes provided explanations for why pride festivals matter, and offered personal stories of individuals dealing with issues of self-acceptance. This decade of Q-Notes sought to connect LGBT readers to a greater community that shared their struggles and supported their identity. In addition to interviews and articles, Q-Notes included event calendars, flyers, and ads that often use subversive imagery. These features mark Q-Notes as a proudly “underground” publication that gave voice to different subcultures. Ads especially explored many aesthetics from punk to glam, and were not afraid of irreverence. 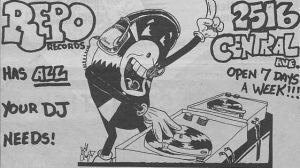 An ad for Repo Records with a punk aesthetic in the January 1996 issue of Q-Notes. 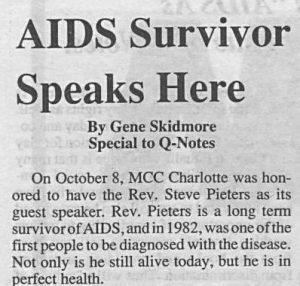 An article in the November 1989 issue of Q-Notes features Reverend Steve Pieters speaking about his experience living with AIDS. Q-Notes also tackled serious issues. During the 1980’s and 1990’s, the AIDS epidemic was devastating LGBT communities. Stigma, misinformation, and fear surrounding AIDS was rampant, and Q-Notes published articles spreading awareness and calling on readers to advocate for organizations and federal programs fighting the epidemic. Personal stories of those living with AIDS and caring for friends and family members with AIDS joined articles analyzing different policies and treatments that could possibly curb the epidemic. 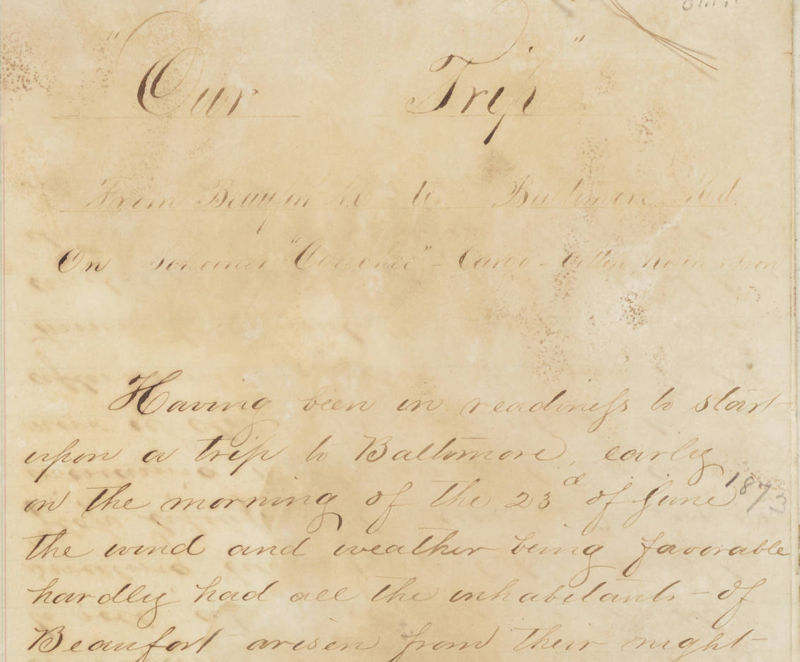 The fight for equal rights and protections is also documented in Q-Notes. 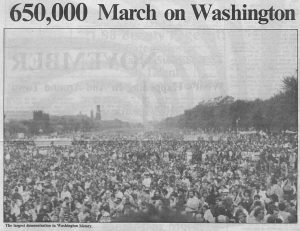 Q-Notes covered large national events, such as the Second National March on Washington in 1987, which pushed for legal recognition of lesbian and gay relationships, and a presidential order banning discrimination based on sexual orientation. Articles also focused on local issues of assault and harassment. One issue included a feature by the North Carolina Coalition for Gay and Lesbian Equality that urges readers to report instances of harassment based on sexual orientation. Part of a feature decrying harassment in the April 1st issue of Q-Notes. Q-Notes has undergone many changes throughout the years, as have issues concerning LGBT communities. Q-Notes exists currently as qnotes and has a print and online version that continues to focus on LGBT issues in North Carolina. To view issues of Q-Notes click here. To see more materials from University of North Carolina at Charlotte, take a look at their partner page, or learn more about them by visiting their website.